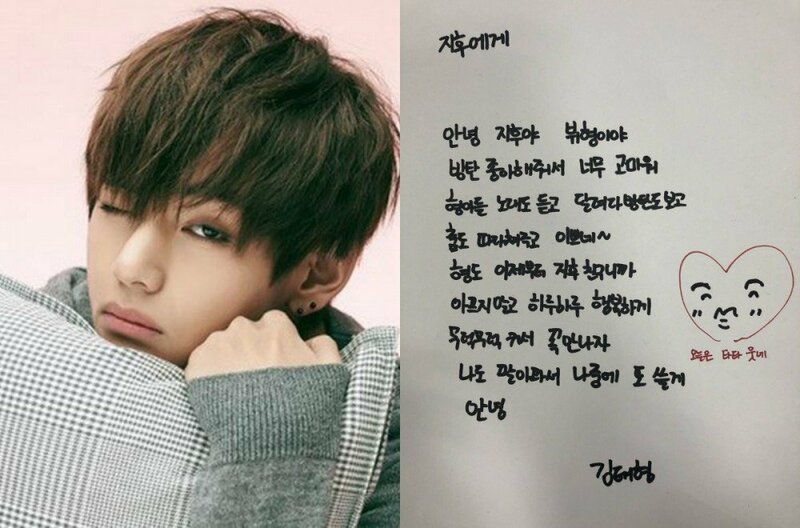 BTS' V replied to a young fan with his very own sweet letter. Recently, it was revealed that a 9-year-old named Jihoo wrote a sweet, loving letter to V to express how grateful and happy he was to have been introduced to BTS by his mother. In the letter below, the fan wrote, "To Taehyung hyung. Hello, my name is Yoon Jihoo and I am 9 years old. I'm hyung's fan. I like other hyungs as well but I like you more. I didn't have any friends. I was a fool who couldn't talk whenever people looked at me. When I go to school, I play alone in the hallway before going back into classrooms. To a person like that, my mom introduced me to hyungs (BTS). I listened to your music, watched 'Run BTS! ', and danced along as well. I was no longer alone but instead found a friend. Thank you for being my friend. I'll write to you again next time since my arms getting tired. Goodbye." 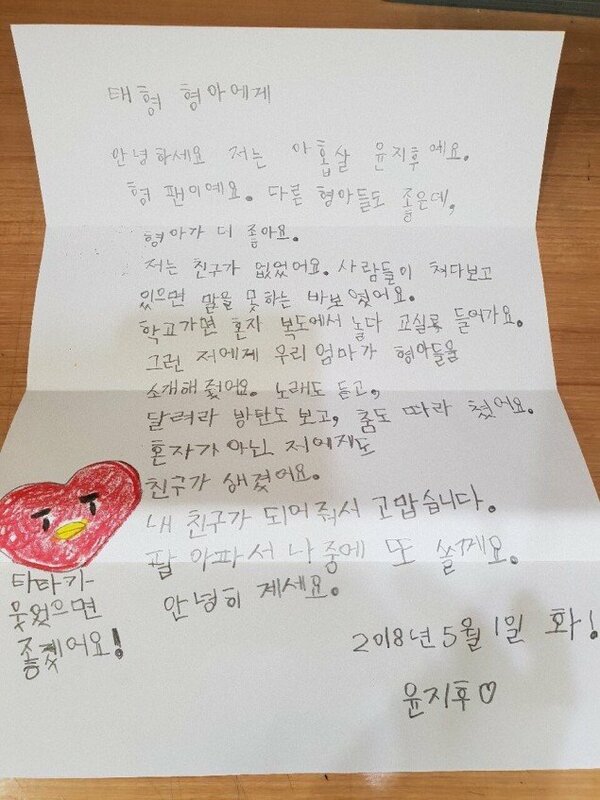 The heartwarming letter went viral and eventually caught the attention of V. Upon seeing the letter, the BTS member quickly gave a response with a handwritten message of his own and shared it via Twitter. V's letter reads, "Hi Jihoo, it's V hyung. Thank you so much for liking us, listening to our music, watching 'Run BTS! ', and dancing to our songs~. From now on, I'm your friend as well so let's meet in the future as you stay healthy and live each and every single day happily. Since my arms getting tired, I'll write to you again later. Bye."